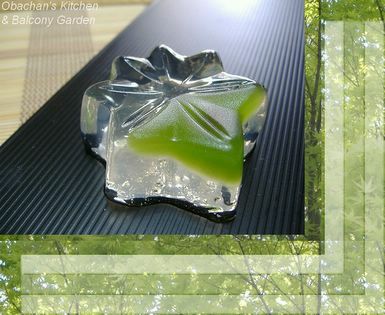 Green maple seems to be a popular wagashi theme for early summer and mid-summer in the world of tea ceremony. In this time of the year, being in the shade created by elegant green maple leaves, you can temporarily forget the unbearable heat in the daytime. The soothing beauty must have triggered thousands of confectioners to recreate it with wagashi. This aokaede is basically a kanten jelly with green colored an (sweet bean paste) just partially covering the top. It is amazing that having this small green part on top can give you a stronger impression of greenness than coloring the entire jelly green. This whirlpool shape is called Kanze-sui or Kanze-mizu 観世水, which is one of Japanese traditional patterns. It derived from the crest of Kanze family -- the famous noh (Japanese traditional drama) master’s family. The design symbolizes the water ripples in the well at their family shrine in Kyoto. The dark spots on the right are a couple of azuki beans representing pebbles in the clear water. Kanzesui jellies often contain small beans, and they give a nice accent to the taste and texture of the jelly. * These photos were taken with my old camera. How are wagashi eaten, obachan? Do they get eaten right away, or can they be stored? They both look really refreshing. I can just imagine how hot and humid it must be in Japan right now! Take care and stay hydrated! These are quite beautiful. They would make quite a display set up on a mirror for a buffet, I would think, like rows of sparkling jewels. How is the kanten flavored? Does the flavor vary with the type of sweet? If it’s not a dry-type, usually they say eat it within a day or two to enjoy it the best, but I think it stays OK for 3 to 4 days (except in the middle of summer). Some can stay OK longer. They also say that most wagashi freezes well. It IS hot and humid. But for me it’s far better than being rained on. 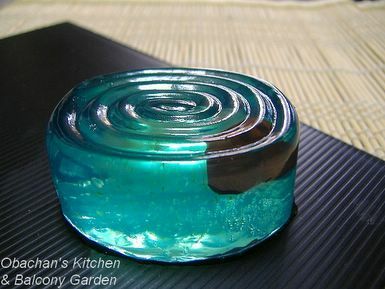 Some kanten wagashi are just sweet and others are flavored with things like juice of fruits, ume, ume-shu, matcha, and so on… I remember once eating a blue kanten jelly like this kanzesui flavored with soda water. BTW, there is such a thing as “chocolate yokan,” too. I just found it on the net. How about that? Taste-wise, they were basically just sweet and that was about it. But they were certainly a feast to the eyes. The kanzesui one is the most impressive one of this kind of dessert I have seen. It looks big and evokes bigness. How do you make the bean paste inside the jelly? Did you put the paste first in the mold then add the jelly liquid before it form? or ??? i was just thinking making a coconut cake with red readbean paste but trying to figure out how to combine them. Can you share the trick?